Phnom Penh. In 1992 Cambodia was passing through an important time of building peace between bitter enemies and looking for new ways to develop a country that was literally destroyed by decades of wars, violence and cruelty. The following years of the end of the 20th century were of big social challenges to defeat poverty and rebuild an entire society, but in a special way with and for the children and youth. Fr. 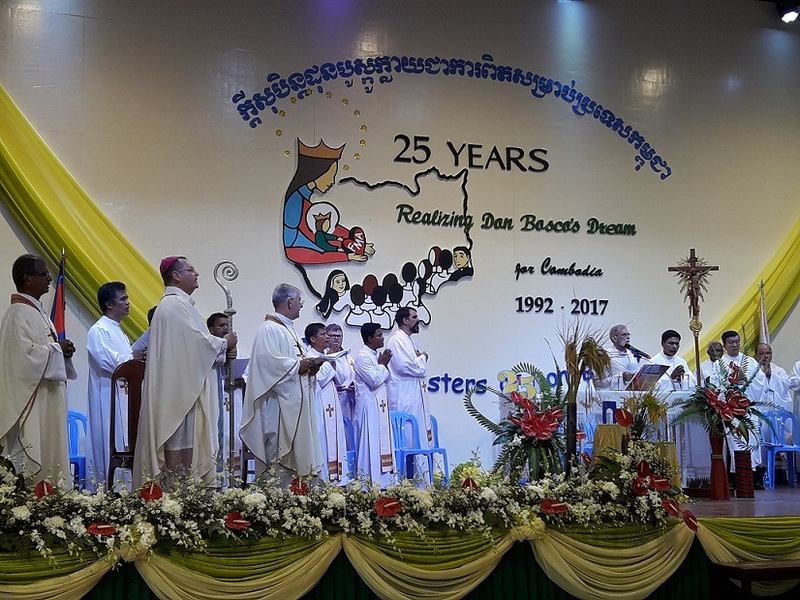 Filiberto González attended the celebrations of the 25th anniversary of the Salesian Sisters in Cambodia. 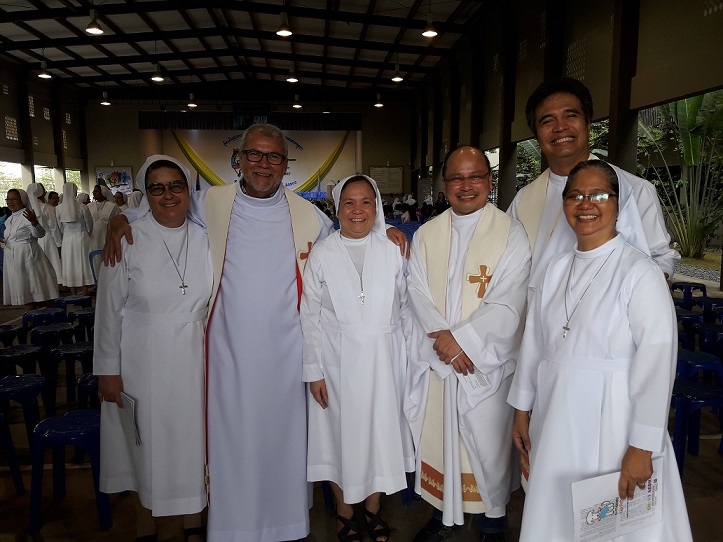 At his left Sister Teresita García, one of the pioneers and former provincial, at his right Sister Runita Borja, FMA representative of Mother General, Fr. Drans Nolasco, SC delegate for FIN and Sister Ched, director of Don Bosco Tekkla. In this contest, the SDB and the FMA brought the Salesian charisma to the Cambodian people. On 8th December 1992, four sisters arrived to Phnom Penh: Colombian Sister Teresita Garcia, Thai Sister Lakana Yawasang, Filipino Sister Maria Elena Estacio and Indian Sister Mary Aayila. They were the first cornerstones to build the pastoral educative project of Don Bosco and Mother Mazzarello in a land when many young people and girls were thriving to survive and open ways for a better future. 25 years after, the Salesian Sisters of Don Bosco are more than 4, more than 30 and they keep growing not only in number, but in the quality of education and the power of Faith. Cambodia itself is the center of the FMA Province of Cambodia and Myanmar (CMY) under the current leadership of Sister Jessica T. Salvaña. Inside the contest of a Buddhist country, where Christianity is a minority, but a joyful minority full of love, union and ecumenical inspirations, the Cambodian Salesian Family is taking a lead. They are not only the SDB and FMA in this story of love, but also the Sister Servants of the Immaculate Heart of Mary, the Salesian Cooperators, the Association of Past Pupils and an upcoming good news for the Volunteers with Don Bosco. During the celebration of the 25th anniversary of the Salesian Sisters of Don Bosco in the Kingdom of Cambodia (1992-2017), there was the presence of this rich reality of persons and groups coming from all Cambodia, but also from abroad: volunteers, benefactors, official representatives, past pupils from the different branches, other Catholic religious and missionary groups and the presence of the three apostolic bishops of Cambodia: Mgr. Olivier Schmitthaeusler, Apostolic Vicar of Phnom Penh and the apostolic prefects Mgr. Enrique Figaredo and Mgr. Antony Sami. Mgr. Olivier dedicated his homily to underline very historical moments of the arrival of the Salesian Sisters to Cambodia and the positive impact of their apostolate. Fr. Filiberto Gonzalez, the World Councilor for the Social Communication, attended also the anniversary with the Salesians of Don Bosco present in Cambodia. After the Mass, there was a cultural program with all the Salesian spirit, including music, dancing and animation between the FMA and their pupils that include children and youth. 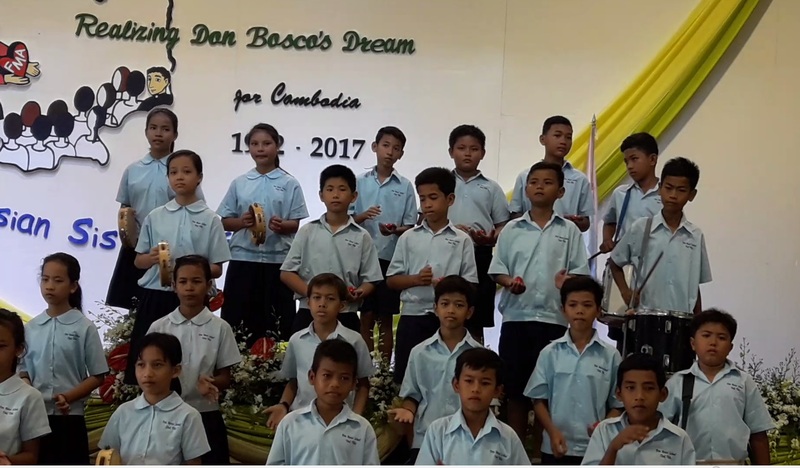 A group of children performed the historical moment of the arrival of the Salesians fathers, brothers and sisters to the Cambodian land.